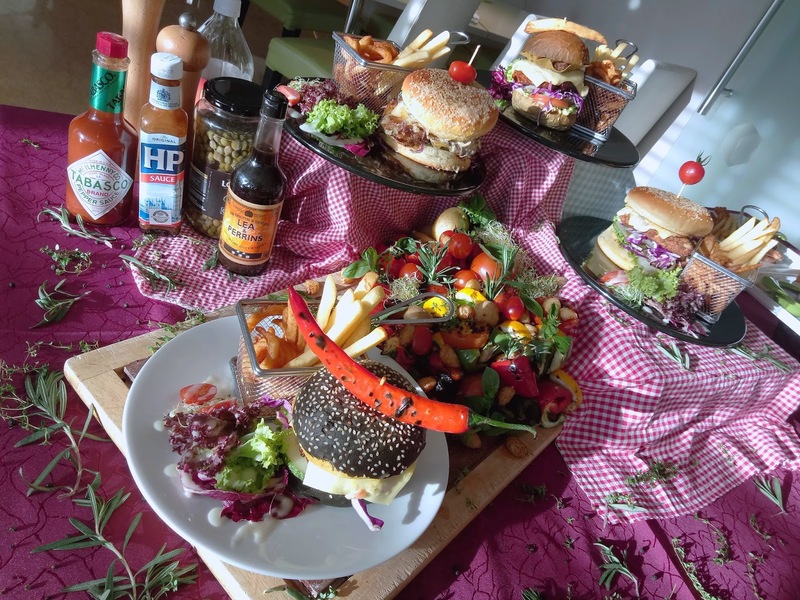 Eastin Hotel Penang is offering the Burger Bonanza for the months of July to September 2018. 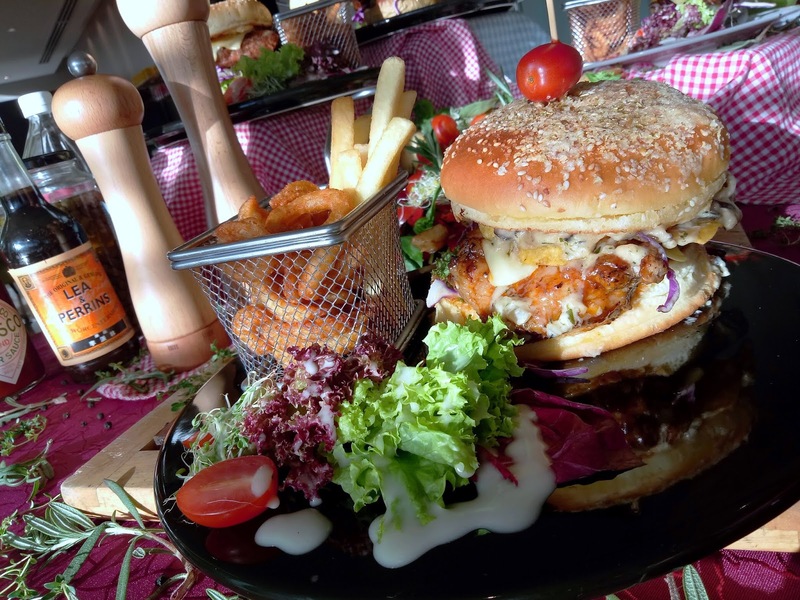 Served from 12:00pm to 10:30pm at Swez Brasserie, the enormous burgers can come with any of 4 patty choices (beef, chicken, fish and lamb) and 3 bun choices (charcoal, green tea and garlic). 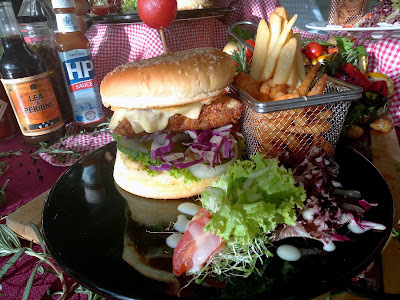 The Bullseye (RM32.00) is the probably the most popular burger here. 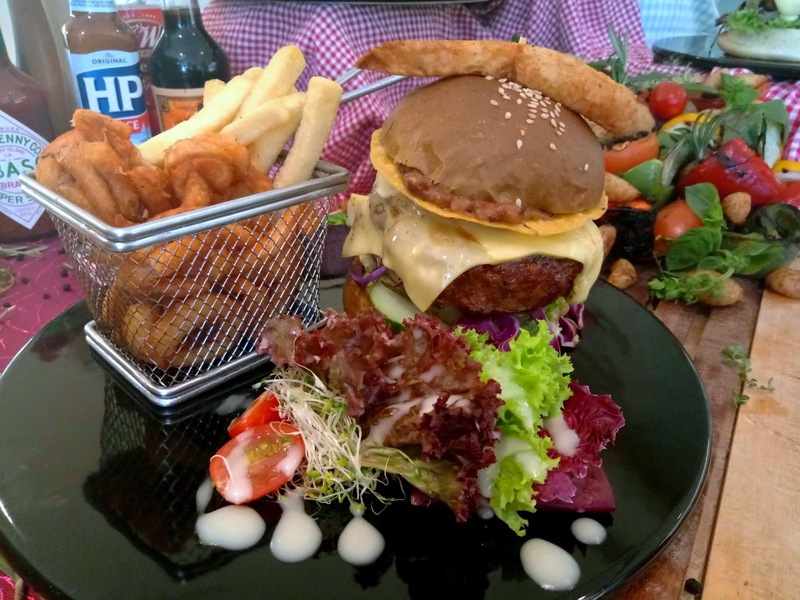 The beef patty is gently grilled to retain its natural juices, making the burger succulent indeed. Also sandwiched inside the charcoal bun are tortilla chips, cheddar cheese, onions, red cabbage and cucumber. Each serving of burger comes with garden salad, alfalfa, steak fries and curly fries on the side. Should customers prefer poultry, the Sweet Chick (RM25.00) is available too. Sandwiched inside the garlic bun is a chicken breast that is grilled to scrumptious perfection. Creamy dressing is used. Unfortunately, I did not have the opportunity to taste this burger this round. My favorite burger among the four is Something Fishy (RM37.00). The choice of fish is grouper, which is rather unusual for fish burgers. The fillet is breaded and fried for the crispy appeal, and then seasoned with black pepper for improved taste. 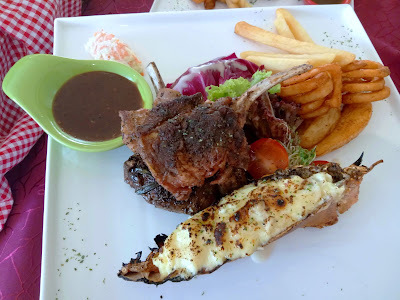 Little Lamby (RM35.00) is a strong contender for my favorite. 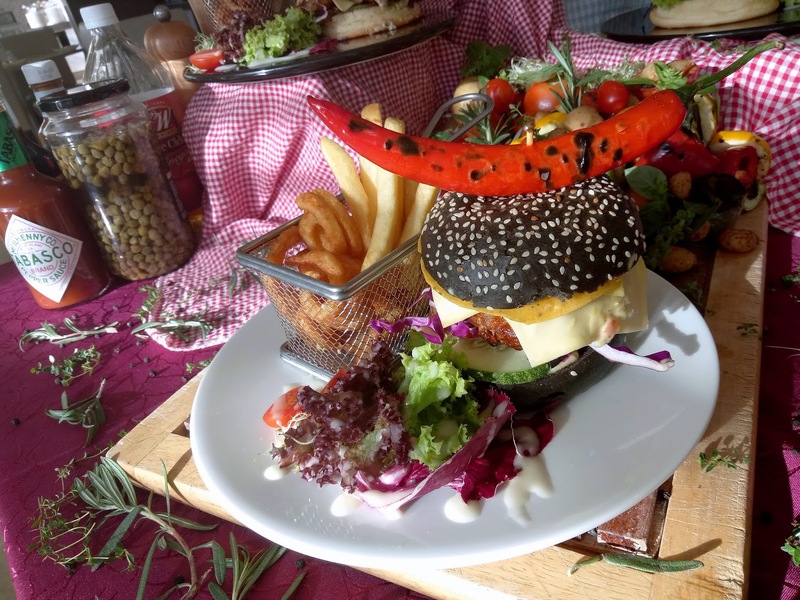 This interesting burger is blessed with a juicy lamb patty. The generous serving of patty has arguably better flavor than its beef counterpart. In addition, cheese seems to blend seamlessly with the chargrilled patty. Green tea bun is used in this case. 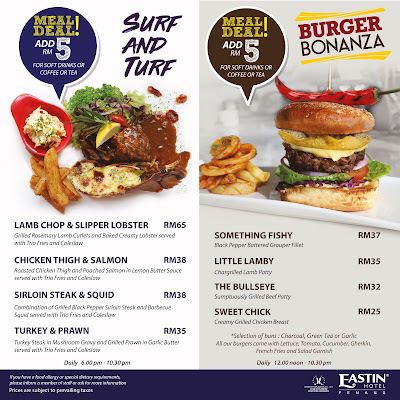 Besides Burger Bonanza, diners can also check out the concurrent Surf And Turf menu. 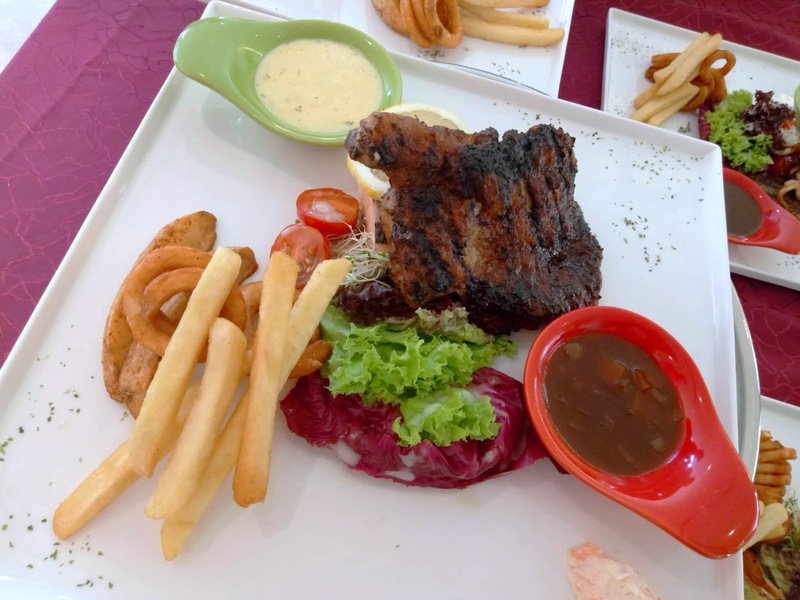 Surf And Turf is an American dish which combines seafood and meat. 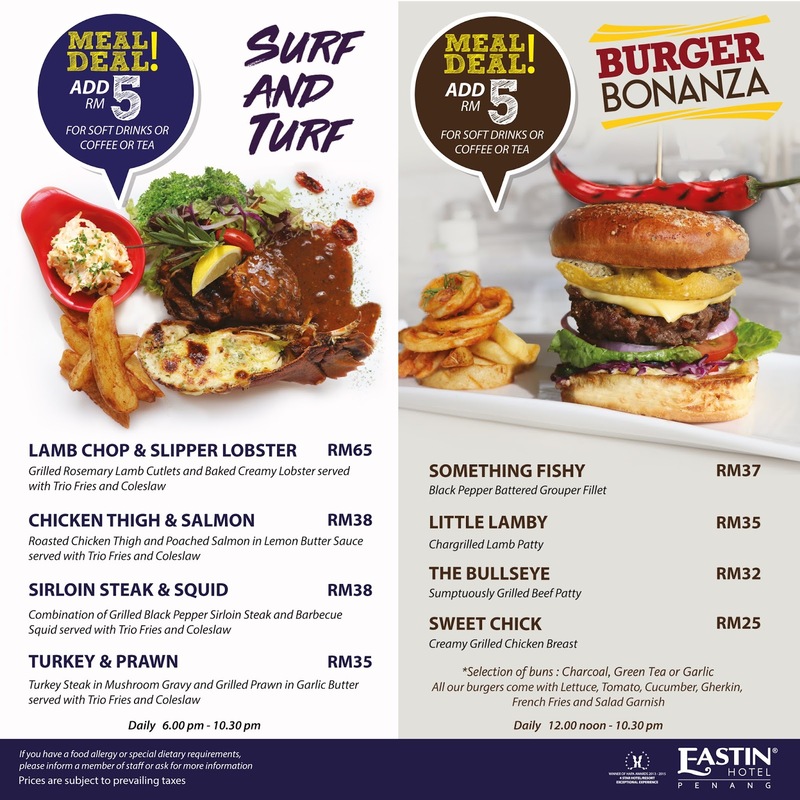 Available between 6:00pm and 10:30pm, the Surf And Turf menu offers 4 different combinations. Each serving comes with trio fries (steak fries, curly fries and fried potato wedges) and coleslaw. The most intriguing combination of Surf And Turf is Lamb Chop & Slipper Lobster (RM65.00). Seasoned with rosemary, the frenched lamb ribs are best enjoyed with mushroom gravy. Joining the platter is a slipper lobster that is baked with cream cheese. I think the lobster's taste is amazing. Chicken Thigh & Salmon (RM38.00) is another crowd favorite. A piece of boneless chicken thigh, thoroughly roasted, is served over poached salmon fillet. Two sauces are provided here: brown sauce and lemon butter sauce. 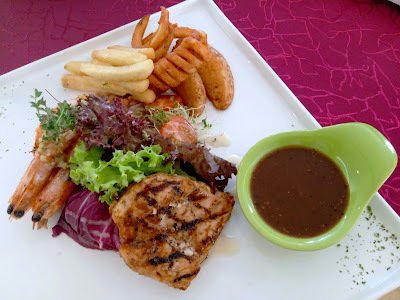 As for Turkey & Prawn (RM35.00), the broiled turkey breast is rather lean. I actually prefer the turkey steak to be tenderer. Also included are two shrimps, nicely grilled with garlic butter to produce a tantalizing aroma. Mushroom gravy is provided as the condiment. 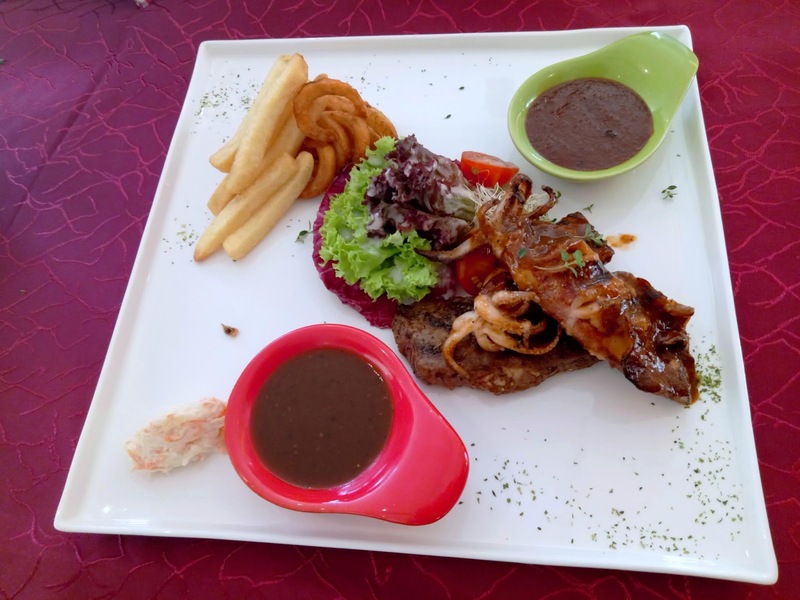 As long as you take beef, you can never go wrong with Sirloin Steak & Squid (RM38.00). The sirloin steak pairs with black pepper sauce in an elegant manner. Meanwhile, the whole squid is barbecued to optimal springiness. Watch out for the plastic-like cartilage in its mantle; it is inedible. Coffee, tea or soft drink is offered for an additional RM5.00 only. 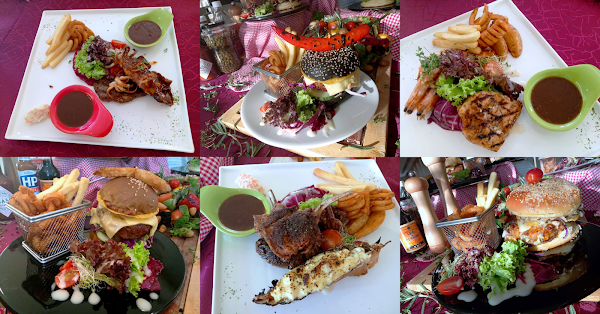 Besides dining in Swez Brasserie, customers can also enjoy their meals at The Lounge should they prefer so. The Lounge's bar has an interesting range of cocktails and mocktails to go with any dish. Last but not least, it is worth mentioning that Swez Brasserie's kitchen has halal certification.